MARY JANE SEATON RADER. On March 31, 2019 in Arlington, VA, died peacefully in her sleep of congestive heart failure. Born in 1919 to Criss and Gertie Purvis of Alexandria, VA, she graduated from George Washington High School (GWHS) in Alexandria, and then Strayer Business College, in Washington, D.C. Upon graduation from the original Strayer campus, Jane, as she was known to family and friends, was employed by the Association of American Railroads where she met her husband, Donald. She was later employed by Dr. Martin Delaney, in Alexandria, as a Medical Secretary, and the Alexandria City School System, from which she retired as Director of Data Processing. Widowed from Donald in 1973 after 34 years of marriage, Jane married Lynn Rader in 1981 and was married two years, until Lynn’s death in 1982. Jane was accomplished in many areas of her life. A member of GWHS’s first graduating class, in 1936, she was the winner of the Virginia State High School Public Speaking Competition that year. 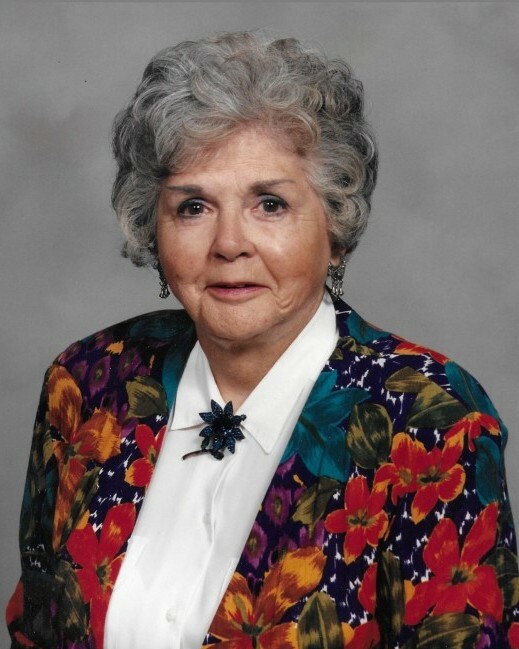 She was active in the GWHS Alumni Association until recently, and had been their oldest member. A gifted musician throughout her life, Jane gave extensively of her gift to others, including her church, and numerous other organizations, as Pianist, Vocalist and Teacher. Most recently, at age 97, she played Silent Night on the piano, for two of her great-grandsons – with one hand. For her almost 100 years, Jane attended the same church, in which she was continuously active. She served many roles at Community Baptist Church (formerly Baptist Temple), in Alexandria, including Deacon, Interim Choir Director, and Sunday School Teacher. Jane was active in the Order of the Eastern Star well into her nineties, and was a member of two chapters for more than fifty years. She served in both leadership and supporting roles in her chapters, including Worthy Matron and Pianist, as well as Grand Adah, Director of Music, and Choir Director, for multiple annual State of Virginia Eastern Star Grand Chapter conferences. Jane was also a lifelong member of the Daughters of the American Revolution. A humble, generous person, Jane was extensively involved in her families’ lives and was a presence at many events. Well remembered is her legendary annual Christmas Cookie baking marathon, in which she made countless dozens of cookies for family and friends. Her children miss the annual family event, in which everyone participated. Although diminutive in stature, Jane was a larger than life advocate for family and friends, and always ensured the right thing was done; she accepted nonsense from no one. She attended many court hearings, in order to obtain justice for her family, and her contributions in letting the court know her opinions were both very direct and greatly appreciated. Jane lived life to its fullest, well into her senior years. She traveled extensively in her later life with her sister Margie, and often with their friends Vivien Seibert and Betty Klotz, visiting Europe and the Holy Land, as well as many North America destinations. She often jumped on a plane to help family members in relocating and did so without question. In 1991, Jane completed the Kole Kole Pass Half Marathon, in Hawaii, with her family, and she participated, along with family members, in the Annual Susan Komen Race for the Cure 5k Walks, in Washington, D.C. in memory of daughter Lynne. Jane was blessed with many friends and was well loved by her extensive family. Her family takes comfort in knowing she is in beautiful Heaven, where she was met by loved ones who preceded her. She was preceded in death, by husband Donald Franklin Seaton, with whom she had four children, sister, Margie Lee Purvis, daughter Mary Lynne Seaton, and granddaughters Crystal Martin, and Stacey Seaton. Jane is survived by son-in-law Jack Martin, (married to daughter Mary Lynne Seaton until her passing) and his wife Charlotte, of Woodbridge, VA., daughter Sandra Seaton, of Alexandria, VA., son Verne and Sarah Seaton, of Jacksonville, NC, and son Michael and Gale Seaton, of Bowie, MD. She is also survived by grandson Andrew and Christina Martin, grandson Paul Lusby, granddaughter Allison Seaton and Luis (Rios), granddaughter Connor Seaton and grandson Kyle Seaton; great-grandson Eric and Sarah Davenport, great-grandsons Aaron Martin and Zachary Martin, great-granddaughters Makayla Lusby, Cheyenne Lusby and Ariel Lusby, great-grandsons Diego Rios Seaton, Luis Rios Seaton and Michael Rios Seaton; and two great-great-grandchildren, Cora Davenport and Ezra Davenport. Family and friends may attend a visitation on Friday, April 26, 2019, from 5 to 8 PM, at Everly-Wheatley Funeral Home, 1500 W. Braddock Rd, Alexandria VA. A Memorial Service will be held on Saturday, April 27, 2019, at 3 PM, at Commonwealth Baptist Church, 700 Commonwealth Avenue, Alexandria VA, followed by family visitation in the church’s Fellowship Hall. A private inurnment service will be held by the family, at a future date. In lieu of flowers, the family suggests donations to Capital Caring.